The Curious Charms of Arthur Pepper was one of my favorite reads from last year, so I was excited to hear that Phaedra Patrick had another book coming out! I saw the cover for this one a few days ago and thought it was lovely but didn't read the synopsis, so I'm glad you shared it today. This sounds so good! This sounds super intriguing, excited for it's release! I have this one on my TBR too, because it sounds like Up-Lit and I need to read more of that. It does sound like it's going to be very charming and uplifting! What an adorable cover! I will have to add this too! I think this book sounds delightful. Truly. I'll watch for it. This one sounds really good! Adding it to my wishlist! Here's what I'm waiting on if you'd like to stop by! I'm also a blog follower. Oh I love the way this sounds! I like the mystery it incorporates with the grandmother and of course BOOKS. Hope you enjoy it! Oh I just saw this one a few days ago, it sounds wonderful! I really hope you enjoy it, it's one I'll be looking out for as well. Well this sure looks cute! That does sound fun, and I love the tea-cup-and-book-stack cover! You gotta love books about books! Books about books are the best. I am so looking forward to this one too, but I also need to check out the Arthur Pepper book too! Ohh! I love the sound of this book and the charming cover---too cute! Thanks for putting this one on my radar! Aw! I love this. I should start reading books with a librarian protagonist since I'm working at a library now. 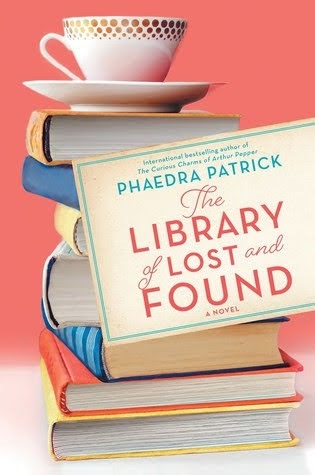 The Library of Lost and Found also sounds like a light and fun read perfect for escapism moments. I hope to start this one very soon. High expectations! Awesome, can't wait to hear your thoughts! I knew that the author of The Curious Charms of Arthur Pepper had a new book being released, but it was only today that I realised it was this title that I've been hearing about (& being greatly attracted by the cover of!). I'm looking forward to this book also - I hope you enjoy upon release!